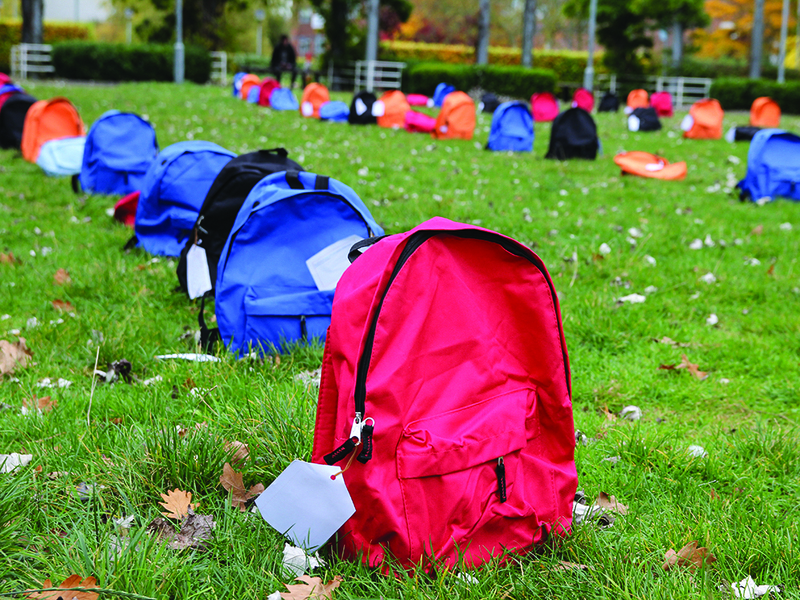 124 schoolbags, representing the average number of student deaths by suicide every year, were laid on the green in DCU Glasnevin to start Mental Health Week on Thursday 13th November. DCU Students’ Union collaborated with the suicide awareness charity 3Ts (Turn the Tide of Suicide) to create the installation around the theme of ‘Share the Load; a problem shared is a problem halved’. VP for Welfare and Equality Podge Henry got the idea after seeing DIT incorporate the theme of ‘Share the Load’, wanting something that resonated with people.“When you actually lay them out and you see just how much space there is there and just how many schoolbags [there are], it kinda hits home for people” Henry said. The installation will hopefully encourage people to open up about mental health and be receptive to others, 3Ts Manager Lise Alford commented, referring to the charity’s three-step model; know the signs, know the words, know your supports. “If you feel that you’re struggling, if you feel that you’re getting down, reach out to somebody you know, and likewise if you’re worried about somebody else” Alford said. The installation was a good way of showcasing the impact suicide has for families as well as individuals according to Head of Disability and Learning Anne O’Connor, describing it as “quite high impact”. Both Henry and Alford said that funding and support for suicide prevention and research in Ireland should be increased, with Alford calling for the installation of a suicide prevention authority and 24/7 centres for suicidal people. “I just want people to know that it’s ok to talk. Don’t feel embarrassed, because there’s nothing to be embarrassed about” Henry said. The SU are committed to continuing to informing the student body about mental health services at student events throughout the year, according to Henry. “The rest of the year, we’ll be letting them know what supports there are so students never feel alone and they know there’s always somewhere you can go” said Henry. These services include counselling, which is free for DCU students, the on-campus GP, the student advice centre and Henry’s welfare office.